Fingernails were assumedly chewed down to the nub as the Panthers rolled out an injury report as long as a DJ Moore catch-and-run yesterday, with two wide receivers missing practice a day after the team placed Damiere Byrd on injured reserve and starters on the defensive and offensive side of the ball sitting out with either lingering injuries or simply taking the day off – not to mention Cam Newton didn’t throw, the “new normal” for the quarterback since Week 7 against Philadelphia. Well, Thursday is a new day. The Panthers welcomed back to practice wide receiver Devin Funchess – who didn’t practice at all last week with a back injury before missing the team’s 30-27 loss to the Seahawks, cornerback Donte Jackson – who didn’t practice yesterday and left Sunday’s game after only a single play with a bruised quad, safety Eric Reid – who sat out yesterday as he continues to battle shoulder injuries, tight end Chris Manhertz – who was wearing a protective boot on Monday and wide receiver Curtis Samuel, who didn’t practice yesterday with a hamstring. Oh, and Cam threw during the portion of practice open to the media. 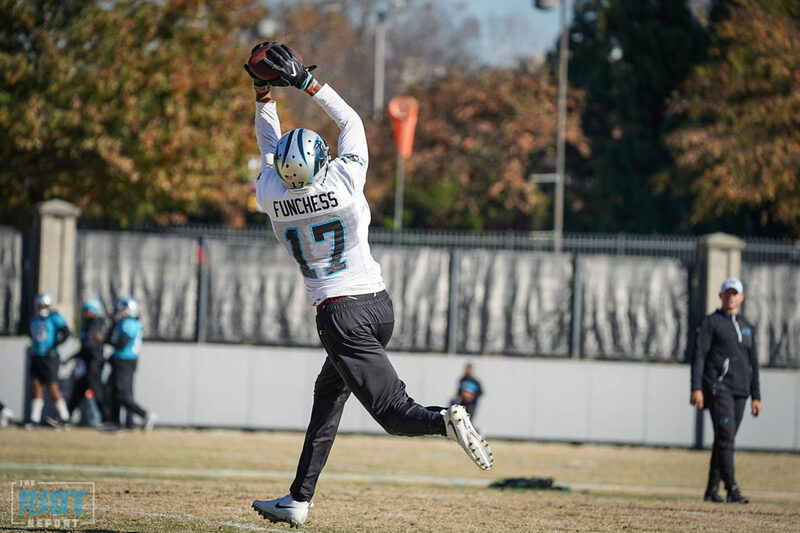 While it appears that almost everyone who missed practice yesterday is on track to play on Sunday, Rivera pumped the brakes a bit on Devin Funchess, who missed last week with the injury but was excused from practice yesterday with a personal matter. All told, the Panthers appear to be fairly healthy heading into Tampa Bay – they’ll need every weapon in the arsenal to keep up with Tampa’s #1 ranked offense and they’ll need their defense to repeat their two-turnover performance as they try to break a three-game skid. The Panthers have forced 14 turnovers in their six wins this season and only one in their five losses, including the past three games. Since 2011, the Panthers are 52-5-1 when winning the turnover battle. Cam Newton Right Shoulder Limited "The New Normal"